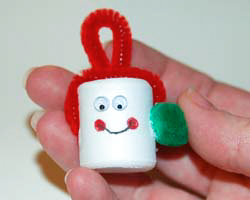 This cute jingle bell snowman can be put together by most school age children. It is also the perfect present for a teacher to make to give to the children as Christmas gifts to take home to their parents. 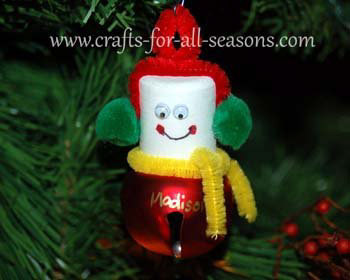 Each ornament can be personalized with the child's name and year. A perfect gift from the teacher! It is made from common craft items that are usually bought in multi-packs, making them inexpensive and easy to put many together at one time. 1. 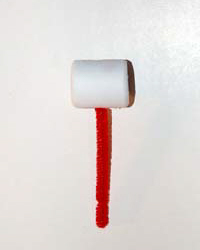 Begin by cutting the pipe cleaner into two 3 inch sections. 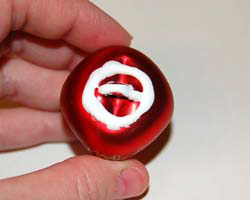 Take one section and poke it through the side of the marshmallow bead. 2. 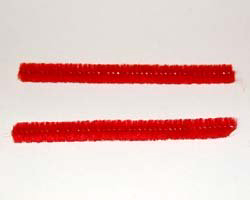 Wrap the pipe cleaner around the top of the bead, as shown, and poke it through the other side to attach securely. This is going to be the strap to the snowman's earmuffs. 3. 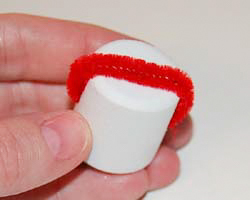 Take the next pipe cleaner and fold it in half to create a loop. 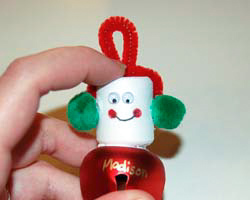 Cut it down to appropriate size if necessary and pierce it through the top of the bead, near the earmuff strap. 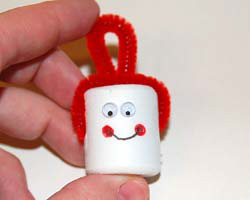 This will be the loop for hanging an ornament hook from. 4. Add the face by gluing on some googly eyes, and then use some fine tip markers to draw on some facial features. 5. Apply some glue to each side of the pom poms, and glue in place on the side of the head, over the ear muff straps. 6. Next, add a liberal amount of glue to the top of the jingle bell, and press the marshmallow head on top of the bell. Allow to dry well. 7. Finish up by tying a small amount of chenille or ribbon around the head and the bell for the scarf. Glue into place if necessary. 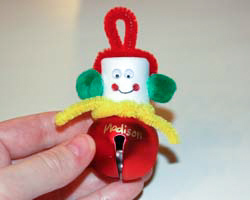 The ornament can also be personalized with a paint pen.